SNFOS is a group of French addon creators. On its website, you will find addons for pak128, and also tutorials for addon making. The website is entirely available in both English and French, click on the small flags, visible on every page, to translate. More than the complete rebalancing, some addons have been changed. In order to avoid compatibility problems due to changed names, it's STRONGLY RECOMMENDED to remove all SNFOS addons from your folder before redownloading them. _ z8800 replaced by z5600 (a bit earlier, same data and same looking). _ z6300 replaced by z5300 (a bit earlier, same looking, more common among Paris'suburb trains). _ names of z50000 carriages changed. _ Improved graphics : z20500, z8100, z22500, MI09, z23000, MS61, z50000. _ Balanced costs for pak128 : all but vehicles in the Archive page. _ Changed payload : z20500, z8100, z22500, MI09, z23000, MS61, z50000, X73500, X2800. _ Constraints changed : z20500, z8100, z22500, z23000, z50000, Fefe's trains. _ Length of z20500's cars increased from 10 to 11. _ Length of z8100's carriages increased from 10 to 11. _ Length of z22500's carriages and MI09's ones decreased from 10 to 9. _ Length of z23000's carriages decreased from 9 to 8. _ Length of all z50000's carriages decreased of 2. New graphics can already be seen on info pages, some of which have been updated, you may just need to empty cache of your browser to load updated pictures. Well I think I said everything, I'm back to addon creating by the way. I thank French authors for their participation. I got news from Aquel, sadly only one of his trucks has been recovered : Renault Magnum for cars'transportation (can be found on French trucks page). New trucks from Eric : Berliet GLR for milk, mail, cars, cooled goods and cement (can be found here). New suburb EMU : SNCF class Z5100. Mount St-Michel has been refurbished, it's available here. And a suburban car : Talbot cars. There is no feedback since the overhaul of SNFOS'site and addons ... any reaction is welcome. Hi everyone. As PAK128 is really lacking vehicles in the 1910 era, I did add a truck from 1910, the Berliet type M 22HP. in this page. It can carry goods, bulk, grain, wood and mail. It has been balanced by Zeno(praise to him). Your trucks are cool! you filling a gap in pak128. This addon it very cool a brand new modell for Simutrans that i like it . _ Z22500 : brought back the ability of placing two propelled carriages next to each other. _ Z8100 : minor graphical change. They all new Addons was make with makeobj 52? I don't remember of which version of makeobj I use :/ Is there any problem with these addons ? 4 single buses of 12 meters, 3 articulated buses of 18 meters, 3 trolleybuses, 1 short midibus, and the biggest bi-articulated french bus called "mégabus", with various liveries using player colors, inspired by real liveries from french' cities. Any reaction is welcome ! New trains : "rames inox" series, stainless steel units of suburban and regional cars. EDIT : First version of RIB/RIOs were not able to be used in multiple units : now fixed. _ Z50000 : completely redrawn roof (you might have to clear your browser's cache to see the change on the picture). _ Talbot cars, Z3700, Z4100 : minor graphical changes. Sources aren't uploaded on graphics.simutrans.com since I'm having problems with it. All trains from me and Fefe and metros from Mega upgraded for pak128 with half slopes (pak128 2.5.0). You have to redownload all of them. Unfinished trains from Fefe haven't been upgraded, they were moved to the archive page. _ Added "régiolis" regional multiple units: Z54500 (electric) and B83500 (diesel), although they have been available for a while on SNFOS. _ DEV inox car : capacity increased from 80 to 90. _ MI09 : gear decreased from 1 to 0.8. _ MS61 : gear decreased from 1 to 0.9. _ Z1200 : gear decreased from 1 to 0.9. _ Z4000 : gear increased from 1 to 1.2. _ Z4100 : gear increased from 1 to 1.3, can now be coupled together directly (without carriages between them). _ Z4700 : gear decreased from 1 to 0.8. _ Z5100 : gear increased from 1 to 1.2. _ Z23000 : gear decreased from 1 to 0.8. _ Z50000 : gear increased from 1 to 1.2. These changes are meant to make these addons fit better in pak128. Class Z3700 moved from suburb stock section to electric regional stock. Pictures of info pages are being replaced, source files on graphics.simutrans are being updated. Most inox (stainless steel) trains got their roof redrawn. Some other trains have been improved too. Pictures of info pages have been updated accordingly. Source files of my trains are no longer available on graphics.simutrans, you will find them on info pages (much easier for me to manage). Looks like there was a bug with filezilla not REPLACING the files I wanted so the trains were not up to date ... it should be fixed now. New modern regional/intercity EMU : Regio2n. (uploaded since January)Early French electric locs by Gwalch: Salt cellars, 2C2 midi and Biquette. New fictionnal train: the intercity train from Final Fantasy 8. New gas turbine prototype high speed trains TGV 001 and 002. (001 was uploaded for a couple weeks but has been updated today). MLM dev. updated (only graphics, no economical balancing) for half heights (a while ago too, but less). New gas turbine prototype high speed trains TGV 001 and 002. I beg your pardon, .. but I thought that name of that company is Alstom, not Alsthom ... or name of company changed from Alsthom (in seventies) to Alstom (presence)? Text on SNFOS pages may be correct - but I am really not sure. Just completed a set of TGVs. I hope you will enjoy them and Merry Christmas ! So many rolling stock! Nice. What's the Generator? Did you know, that we have a few of HLE21 in Poland? I don't even know, why they were bought. 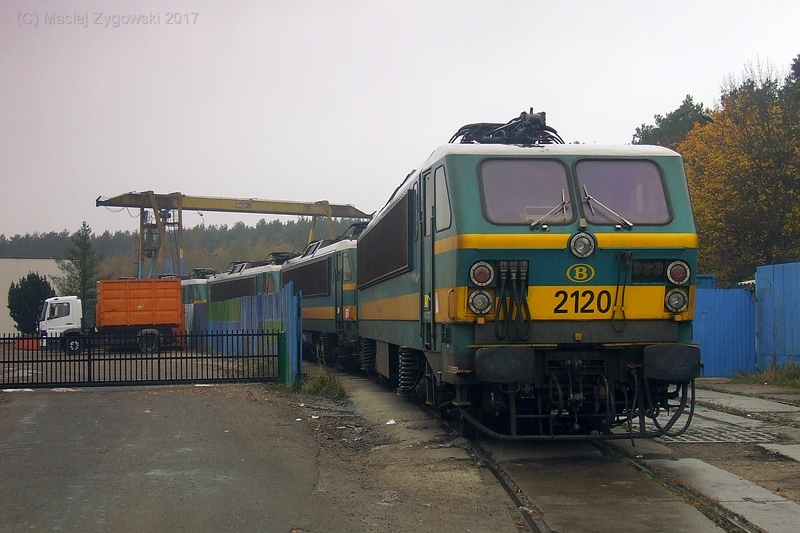 [SNCB Class 12] They were withdrawn from service in 2012 because Class 13 locomotives had by then lost most of their passenger workings and were available for freight. Class 13 was more powerful and also had the same dual voltage capability as Class 12. All Class 12s were stored inside at the dêpot of Stokkem, near Arlon, upon withdrawal. During 2013, locomotive 1203 went to the Czech Republic for service trials. In mid-2014, loco 1203 was intensively tested at Velim in the Czech Republic under 25000 V overhead and did very well. It was then sold to open access operator XTR-System Development in the Czech Republic with an option to buy the entire class. I think you're still close to solution. I believe some polish manufacturer will repair these locomotives and the sell them to the Czech Republic. I hope you'll like it and good game ! I'm back ! And I have some new addons for you ! Two new addons and one update for this week ! A new set of wagons is availible ! It's a covered UIC wagons set, three versions are availible, the first period version, the second period version et the third period version.